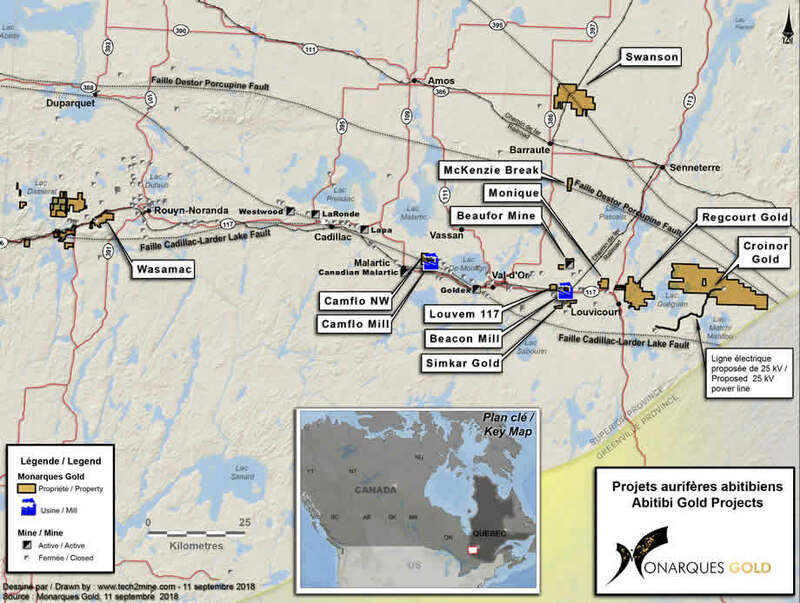 Monarch Gold holds a 100% interest in the Regcourt Gold property. The property is located at the eastern end of the Val-d’Or gold mining camp, some 30 km east of Val-d’Or, and is easily accessible via Route 117. It consists of 94 claims covering an area of 38 km2 near the centre of the western border of Vauquelin Township. The property is subject to a 1.5% and 2.5 % NSR. The Regcourt Gold property is located in the eastern part of the Archean Abitibi Greenstone Belt of the Superior Province, in close proximity to the well-known Larder Lake – Cadillac Fault deformation corridor. The property is underlain by felsic and mafic volcanic rocks intruded by east-west striking, sub-concordant diorite sills and feldspar porphyry dykes. Lesser amounts of greywacke, shale, iron formation and felsic volcanic rocks may be present. Large felsic stocks (granitic and dioritic) intrude the sequence along with late, northeast-trending diabase dykes. Local metamorphic grade around plutons reached middle amphibolite facies; however, the regional metamorphic grade is greenschist. The Regcourt Gold property mineralization shows similarities with that of the Beaufor Mine located nearby. The first gold showings were discovered in 1944 when a rock outcrop was stripped, exposing a wide quartz vein that returned an average grade of 8.13 g/t Au over an average width of 0.76 m and a strike length of 67 m. This work was done prior to the adoption of Regulation 43-101 Respecting Standards of Disclosure for Mineral Projects and can therefore not be used for resource estimation.